1. Add the chili pepper (whole) to 2 cups of boiling water. (What you want here is jalapeno infused water. I put slits in jalapeno). Boil until reduced by half. Strain and set aside (with whole chili pepper I did not need to strain water). 2. In a heavy-bottomed saucepan, combine the milk, & vanilla. Heat until just simmering. Add the chocolate and sugar or honey and whisk until they’ve dissolved. 3. Remove the pot from heat. 5. Optional:: Add cinnamon stick to each cup. If your hot chocolate is too thick or hot, thin with milk. Need more kick? Add Godiva Liqueur. * The jalapeno is the key to this recipe. 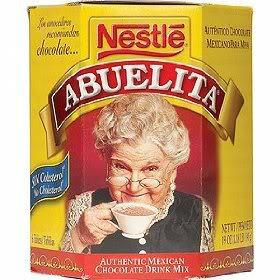 It adds a warm flavor without changing the taste of the Abuelito chocolate. I placed a whole jalapeno (with multiple slits in the side) in hot water and boiled for 15 -25 minutes. Use the kind you like best for flavor and hotness. I personally like jalapenos, but any medium-level hot pepper will do. I would shy away from anything like a habanero, which is too hot for something like this. It would overpower not balance the sweetness of the chocolate and sugar/honey. If you hunt around at a larger supermarket, you’ll likely be able to unearth Nestle’s Mexican Hot Chocolate tablets or a similar product.